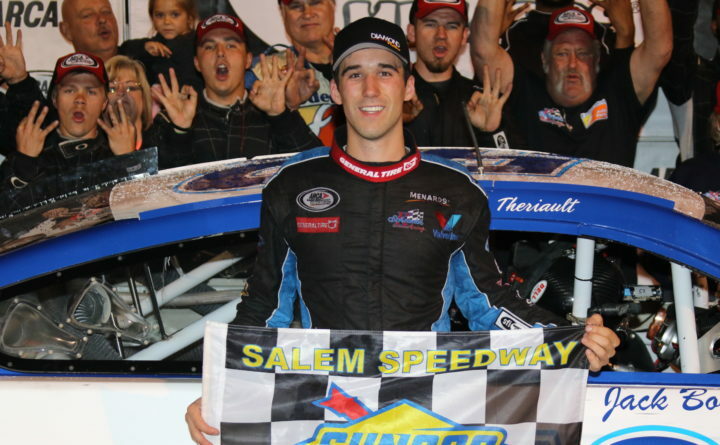 Fort Kent’s Austin Theriault made it three wins in a row in the ARCA series on Saturday night. He passed Zane Smith with four laps to go to capture the 102nd running of the Eddie Gilstrap Motors Fall Classic at Salem Speedway in Indiana. It was his series-leading sixth win of the season and it all but clinched the points championship as he has extended his lead to more than 300 points over second-place Dalton Sargeant with only three races remaining. 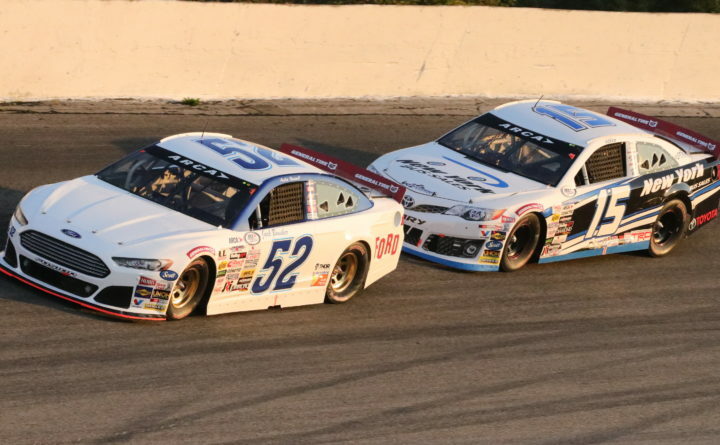 Theriault led the first 136 laps before Tom Hessert beat Theriault off pit road to wrest the lead away from him. Smith maneuvered past Hessert to take over the lead on lap 142 but Theriault eventually cleared Hessert to move into second and he went underneath Smith on lap 196 to take the lead for good on the .555-mile paved oval track. “There was a little bit of banging, door to door. It was hard, side-by-side racing and I was able to clear him,” said Theriault. Theriault couldn’t recall if he had ever won three races in a row at any level. He pointed out that the team’s work ethic has been critical to its success because they don’t have the budget or number of employees some of the other teams have. “We’ve been doing a lot with less,” said Theriault. Theriault said they experimented with the setup on their Ken Schrader Racing Ford in preparation for the final three races, which will be run at intermediate-size (1 1/2-mile) tracks on which they have struggled. The final three races are at Chicagoland Speedway (Thursday), Kentucky Speedway (Sept. 22) and Kansas Speedway (Oct. 20). “I didn’t feel that we would have a dominant car but when the green flag dropped, no one challenged us. We had the car to beat,” said Theriault. “After the final restart, the 25 car (Hessert) and 28 (Smith) dropped off so, after 15 laps, we knew nobody would be able to stay with us,” said Theriault. It was ARCA Throwback week and Theriault’s car was adorned with a Jack Bowsher color scheme. The late Bowsher was a three-time ARCA points champion and he won seven straight ARCA races at Salem Speedway between 1963 and 1965. “It was cool for us because Jack’s daughter and granddaughter were there to cheer us on and be part of the team and his longtime crew chief, who was with him when he won those seven races at Salem, came around in his motor scooter,” said Theriault. Theriault has been a model of consistency. He has 14 top-five finishes in 17 races, 10 top-threes and has finished either first or second nine times. He now has five consecutive top-three finishes. Theriault said the intermediate tracks will prove challenging because teams with more resources have an edge. “But if we’re willing to put in more time and effort than the other teams and we stay after it, we can overcome it,” he said.